We have been supplying plastic shopping carts since 1959. 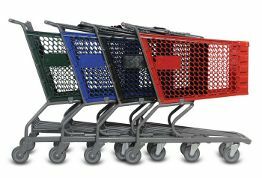 People purchase plastic shopping carts for a variety of reasons, the most prevalent being branding. Although we only carry a few colors, you can usually choose a color that will go with your decor. Another reason people buy plastic shopping carts is for their durability of the baskets and their lack of rust. Other people purchase plastic shopping carts because they are easier to see in the parking lot. Whatever your reason - We have the cart for you. You can view detailed information, including dimensions and capacity of the plastic shopping carts by using the links below. Please note that the links below will take you to my online store and will allow you to see the detailed dimensions and Pricing.